Assembling for the Emory Healthcare 500 at Atlanta Motor Speedway on Labour day weekend Sunday night, 43 cars led by pole sitter Denny Hamlin took green for 325 laps around a very fast race track. A tame race through the early one-third distance absent of caution breaks, the Emory Healthcare 500 was dominated early by pole sitter Denny Hamlin. A effort appearance early for Joe Gibbs Racing, the team's leading #11 Toyota was followed by Kyle Busch in the #18 car. With the first set of green flag pit stops being accomplished after 50 laps, Kyle Busch was able to sneak around his teammate Hamlin through a fast pit road entrance where Busch braked his #18 at the last second. Taking the 1st place spot after the round of stops are completed, Kyle Busch was alerted his speedy entrance was in fact too speedy. NASCAR penalized the #18 Toyota on lap 51 dropping the Joe Gibbs Racing backed effort to 23rd. Able to retain a spot on the lead lap, an additional situation resulted in a premature pit stop for Kyle Busch twenty laps after getting issued his speeding penalty. Pitting in concern for a loose wheel, Busch's #18 car returned to the NASCAR Sprint Cup pack deeply one lap down. When the #18 Toyota was initially dropped to pit road due to the penalty, Tony Stewart sailed to the lead. Holding off Denny Hamlin near the end of the fuel run, Stewart stayed out in front through a second group of green flag pit stops. Seeking his first NASCAR Sprint Cup win for 2010, Tony Stewart resumed leading the Emory Healthcare 500 once cars cycled through pit road service. This lead was held under green until the race's first yellow flag wasn't thrown until lap 133. 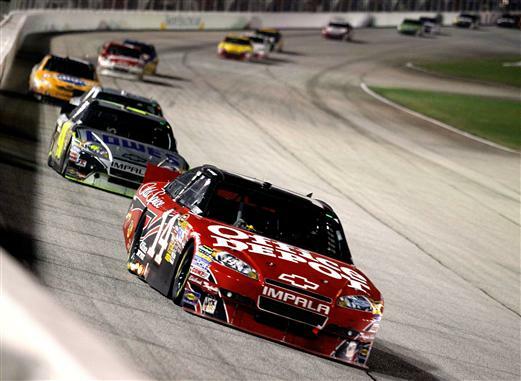 The #14 Old Spice Chevrolet would spent a lot more quality time in first place this night at Atlanta Motor Speedway. Declared a debris caution (even though the actual debris was not seen on television) the caution was a welcoming pause in the action for drivers and fans. Having been lapped just prior to the caution, the then-16th place #88 Chevrolet by driven by Dale Earnhardt Jr appreciated the yellow flag most as the Hendrick Motorsport car was allowed back into the lead lap pack. As the race restarted on lap 139, the once strong #11 Toyota of Denny Hamlin lost a few spots under green but there was no indication a problem existed with the Joe Gibbs Racing. A short five laps after relinguishing positions, Hamlin's troubles became much more serious as the #11 engine blew on the Atlanta front stretch. A nightmare for Denny Hamlin's hopes of starting strong into the NASCAR Chase for the Sprint Cup, this came as a sacfrice play for Joe Gibbs Racing as Kyle Busch's #18 Toyota received a free pass. After the race went 133 laps without a caution, a third caution would fly within 20 laps. Started when the #16 Ford of Greg Biffle was tapped by the Ryan Newman-driven #39 Chevrolet heading into the 3rd turn. Drifting through the turn 3-4 complex, The #16 Ford was almost under control until inavertedly clipping Elliott Sadler's #19 Ford. 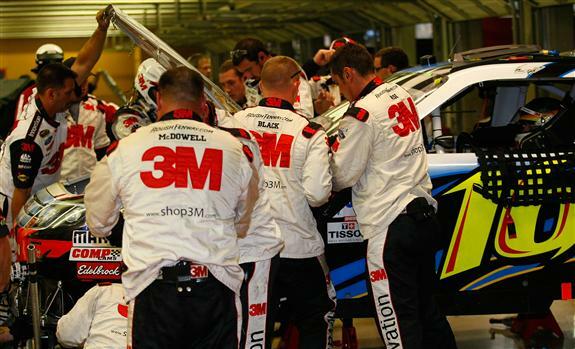 Biffle's car would return after massive front end repairs. As the NASCAR Sprint Cup drivers once again returned their cars to the attention of the under 15-second pit crews, one of the final hold-outs to pitting was the #29 Chevrolet of points leader Kevin Harvick. Staying out those extra few laps would ultimately prove to be an undoing for the Richard Childress Racing driver. Making an entrance to pit road wih 72 laps to go, Harvick's left-front tire blew. Entering with a comfortable points lead, Harvick's run of Atlanta would cost him some of that lead as the #29 Chevrolet spent the latter stages of the Emory Healthcare 500 wounded by fender damage. Sprint runs were set up through the remaining distance of the NASCAR Sprint Cup race thanks to a several cautions spanning from an engine explosion on the #82 Toyota of Scott Speed and a later caution thrown for a Brad Keselowski spin. Keeping the front tight, the final yellow flag was the result of some rough and tumble racing between #39 Chevrolet of Ryan Newman and Kasey Kahne's #9 Ford. Taking the lead for the final time, Tony Stewart had brief opposition from the #99 Ford of Carl Edwards but pulled well out to lead the final 20 laps winning the Emory Healthcare 500 at Atlanta Motor Speedway. His first win of the 2010 season, Tony Stewart led 176 of the 325 laps for his 4th Sprint Cup series victory at the 1.54 mile track. With the winner of the Atlanta Sprint Cup event ending a 31-race winless streak, the top-5 contained a collection of drivers needing good runs. Finishing 2nd in the race, Carl Edwards has results in the top-10 for 7 of the past 8 NASCAR Sprint Cup events after a sluggish start of 2010. Clearly, the new Ford engine is having a positive impact in bringing the Roush Fenway Racing team back to the competitive forefront. More recently enduring a tough stretch of races, Jimmie Johnson got a much-needed 3rd place result ahead of Jeff Burton and Kyle Busch. During and especially after the Atlanta NASCAR Sprint Cup race, the top-12 in points were a main focus as the 2010 Chase for the Sprint Cup starts with only the Saturday night race in Richmond remaining. Kevin Harvick is guaranteed to be the top in points after Richmond (at least before the realignment for the Chase)but 3rd through 8th place in the standings can still fluxulate. As for the 12th place bubble spot, Clint Bowyer holds more than a 117 point advantage over 13th place Ryan Newman. In fact, Newman might have lost a few points at Atlanta when Kasey Kahne tapped the #39 Chevy as payback late in this event. Prior to the Atlanta Motor Speedway event, it was announced that Speedway Motorsports (the parent company of the 1.54 mile oval will only return for this Labour Day event in 2011. Atlanta Motor Speedway should feel comfortable that they will retain the date with excellent night time weather and a sizable fan attandance.